With an increasing number of mobile devices becoming available many small business owners are finding it harder to manage their staff email accounts. Many of our customers ask is there a way to easily see the entire message history of a mailbox and make it available to any staff member from any device such as a laptop, desktop, mobile or tablet? The answer is yes! However there some issues to be aware of before you go and set things up. Most email software packages use a special protocol to receive messages, the two most common being POP and IMAP. POP is a one way communication path with the connecting device pulling down all the messages from the server. By default POP doesn’t leave email on the server for other people to retrieve, nor can you sync any draft or sent messages you might have created. IMAP on the other hand is a two way communication path. Your email remains stored on the server and your device syncs any changes that have occurred. IMAP will ensure that new email is accessible from any device at any time, allowing you to check your email at work from your laptop, or at home with your mobile phone. Draft and sent items are also available to you at all times allowing you to see your entire message history from any device. 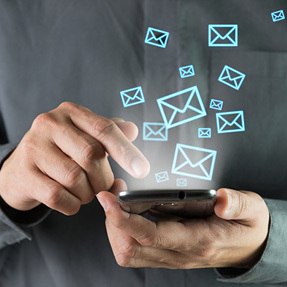 For most businesses we would strongly recommend that you configure each email account to use IMAP. It’s a faster, more reliable, protocol that will allow you and your staff greater flexibility when it comes to storing and managing your email.